Interest was witnessed on selected counters such as blue chip stocks John Keells (JKH) and Distilleries (DIST) and the poultry stocks at Colombo Stock Exchange on Tuesday the 5 April 2011. “While these stocks recorded gains, other stocks declined although recording thin volumes.” Brokers added. Colombo Stock Indices gained during early trading and closed in red. The All Share Price Index (ASPI) closed at 7,370.02 points, dipped 0.04% by 3.12 points and the Milanka Price Index (MPI) dropped 0.15% by 10.44 points closing at 7,022.28 during the day. 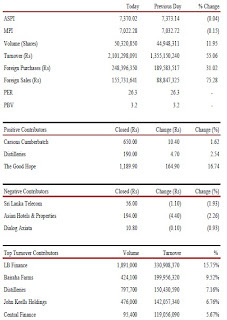 Total Turnover recorded to be Rs.2.1 billion rose 55.06% with a total volume of 50.32 million shares changing hands (down 11.95%). Foreign purchases rose 31.02% to Rs.248.39 million and foreign sales dropped 75.28% to Rs.155.73 million. Price to forward Earnings Ratio (PER) was stable at 26.3 times. However, net foreign buying was witnessed for four consecutive days, specially on John Keells (JKH), which is a good sign. Bank, Finance & Insurance sector was the main contributor to the market turnover mainly due to LB Finance (LFIN) with the sector index decreasing 0.11%. 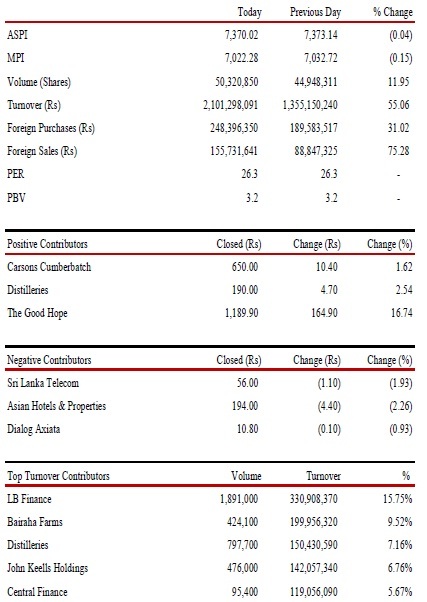 LB Finance (LFIN) was the main contributor to the market turnover with two crossings of 1,836,400 shares at Rs.175. The share price increased by Rs.4.90 (2.88%) and closed at Rs.175. Beverage, Food & Tobacco sector also contributed to the market turnover due to Bairaha Farms (BFL) and Distilleries (DIST) with the sector index increasing 1.01%. Bairaha Farms (BFL) continued to surge along with other poultry related stocks. Several other crossings were recorded including 20,000 shares of Central Finance (CFIN) at Rs.1,249.90 per share and Aitken Spence (SPEN) 500,000 shares at Rs.165.00.